Unemployment Crisis to Last Until 2021? 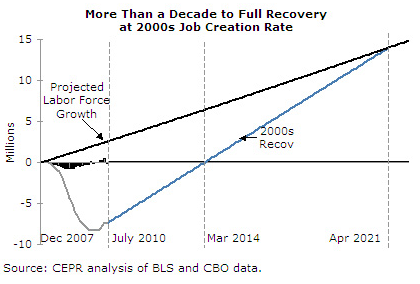 Calling their report "The Urgent Need for Job Creation," economists John Schmitt and Tessa Conroy projected job growth based on "the fastest four years of the early 2000s expansion"—in other words, something approaching a best case scenario. Under those conditions, the CEPR finds that "we will not return to the December 2007 level of employment until March 2014." Which sounds reasonably good, until you realize that we'll also need an additional 6.5 million jobs by then to keep up with population growth. That, says the CEPR report, means "the economy would not catch up to the expanded labor force until April 2021." 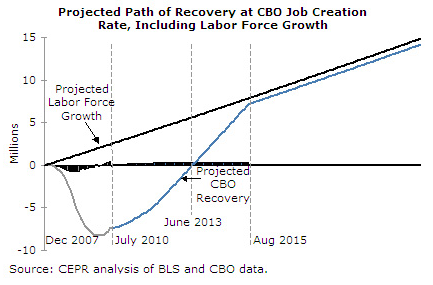 And here's one that shows a more optimistic outlook for the recovery, based on the Congressional Budget Office's estimates. View more graphs—and the full report. The economists at the CEPR aren't the only ones who are worried about the state of job creation either: yesterday, a group of "16 notable economists, historians and thought leaders" issued a manifesto on The Daily Beast, calling for another round of government stimulus as well as tax credits to try and boost the economy and create jobs. Others have signed up since: at last count, some 40 experts had endorsed it.